Brendan McKenna and the team at Richmond Coaches of Lisburn were popping the champagne corks after they swept the boards at the recent Federation of Passenger Transport (NI) annual Gala Dinner and Awards ceremony. The only event of its kind for the passenger transport industry in Northern Ireland, some 200 members and guests attended the ceremony which was held at Galgorm Manor Hotel on Saturday, February 6 last. FPT NI is the trade body promoting the use of public transport and represents the province's leading bus and coach operators. For the first time, FPT NI awarded the Coach Driver of the Year award to Richmond Coaches' entire driving team while the McKenna family-run operation also walked away with the prestigious Coach Operator of the Year 2016, Best New Large Coach 2016 (DAF VDL futura 2) and a Commendation for Best Refurbished Coach (Scania Irizar PB) awards. “We are delighted to have received these awards as they underline our consistency with high standards,” Richmond Coaches director Brendan McKenna said to Irish Trucker. 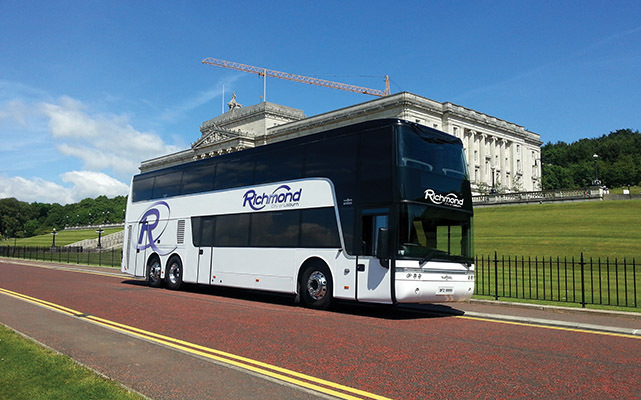 Richmond Coaches Ltd is one of the leading private coach hire and tour operator specialists in Ireland and they have the credentials to back that claim up. Based outside Belfast City, they are licensed for travel throughout Ireland, the UK and Europe and are ideally located to service Dublin, Belfast and the city of Londonderry airports. As the interface between bus operators and their customers, the industry depends heavily on its drivers to provide the kind of customer service that the travelling public expect and rely upon. With 18 employees on their payroll, Richmond Coaches pride themselves on their friendly and efficient service and staff. All of their drivers are uniformed and ready to make their clients' journey both a comfortable and enjoyable experience. Their trained drivers are happy to help and will do their best to ensure, when you travel with them, you will want to do so again. “It's very much a team effort here at Richmond Coaches I believe the award success recognises the calibre of the team we have here. “We have a very strong order book for 2016 and that is in no small part down to the team we have. We enjoy a lot of repeat and return business and we're successful in securing new contracts on the back of that. If you have a tour you would like to organise, coach holidays you would love to be involved in, or just need an executive class coach to transport delegates between the airports and conferences, Richmond Coaches are ready to take you there. Set up in 1997 by Brendan's late father, Gerry McKenna, the family-run company has developed a reputation which is the envy of many of their competitors. No strangers to awards success, their curriculum vitae also includes past 'Coach Operator of the Year', 'Vehicle of the Year' and 'Coach Driver of the Year 'accolades. “We're very fortunate to have been the recipient of quite a few awards,” Brendan added. Some of Richmond Coaches' most popular services include airport transfers, private hire, schools and corporate. Their extensive fleet of vehicles, all fitted with satellite tracking devices, has been assembled to cater to a wide range of needs. Whether it’s 10 or 50 people, they have the right, most cost-effective vehicle for the job. “We're very optimistic about the future,” Brendan stated. “As regards expansion, we have a few irons in the fire which we should be able to make public in the next two to three months. That will involve new fleet additions and a bit of diversification. To find out more or to request a quote, contact Richmond Coaches at the numbers below. Their friendly staff can assist you. Wherever your destination, whatever the size of your travelling party, they have the coach to meet your requirements, your expectation and your budget. Not to mention drivers of the highest possible calibre!